This week we introduce two fresh faces to our Trendsetters Chart! 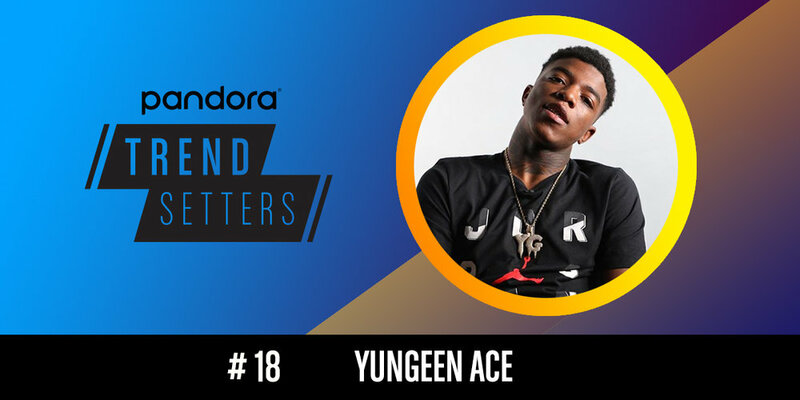 Yungeen Ace and Tauren Wells both make their debut on our chart after garnering over 2,000 weekly artist station adds on Pandora. Check out their stations today! Jacksonville, Fla., rapper Yungeen Ace has been on the come-up for a while -- having debuted on the Predictions Chart in June. Now, he debuts on Trendsetters as word about his debut mixtape, Life of Betrayal starts to spread. The two most popular songs from the tape so far are "Jungle (feat. Jaydayoungan)" and "Wanted (feat. YoungBoy Never Broke Again)." Yungeen Ace debuts this week with over 2,100 weekly artist station adds. Christian pop-rock artist Tauren Wells debuts as the buzz loudens around his latest single, "Known," which appeared on his Grammy-nominated 2017 album, Hills and Valleys. Wells, who was formerly the frontman for the Christian rock band Royal Tailor, debuts with over 2,000 weekly artist station adds on Pandora.